We received 3-6 inches of new snow.❄️ Groomers reported after their run yesterday the trails are in excellent condition, all trails were groomed. The 💧waterhole on Trail #2 27 miles west of Watersmeet is starting to open up again so use caution. ⚠️ It’s just smart to ride with caution this time of the year anyway, you never know what’s around the next curve or how the same trail could have changed on your way back!! Groomers will be running today/tonight and will continue to groom daily as the temperatures allow. Looks like we’ll be in the 40’s by Wednesday. Winter snowmobiling excitement runs rampant throughout the Watersmeet Michigan area. Hundreds of lakes and acres of state and national forest lands provide a winter wonderland for enthusiastic riders. Watersmeet Michigan and Land O’ Lakes Wisconsin, located on the border of Wisconsin and Michigan’s Upper Peninsula provides an excellent home base for your winter excursions. Trails to the north connect with the serene trail network of the Upper Peninsula. Corridor 6 guides riders across the northern section at the eastern border, through Land O’Lakes as it continues on to Presque Isle. Watersmeet, Michigan is the gateway to snowmobiling in the Upper Peninsula with access to Minnesota, Lower Michigan and Wisconsin. The Upper Peninsula of Michigan has a reputation for an extensive groomed snowmobile trail network, exciting terrain, and an abundance of snow. In the entire State of Michigan there are over 5,800 miles of snowmobile trails located throughout six state Forest, three National Forests and many acres of privately owned lands. About 230 miles are located in the Ottawa National Forest. Yearly Michigan trail permits are required. 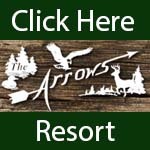 This area offers the pure enthusiast miles of groomed trails in the north in Upper Michigan and short trips to various Wisconsin towns to the south, east, and west. Gas, rentals, sales, and meals, are within minutes of each lodging facility The snowmobiler can ride from any lodging location without the need of the vehicle that brought them. Annual snow fall generally between 100 and 250 inches 35 miles of groomed trails that interconnect.